Back in Summer 2010, IK Multimedia invited guitarists to rock out with nothing more than their iPhones, earbuds and a natty variant on the previously desktop/laptop-only AmpliTube amp/FX sim software suite. 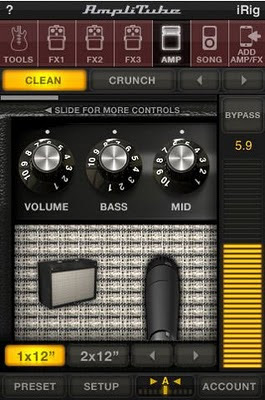 Naturally, an audio I/O was necessary, hence the iRig, an inexpensive piece of hardware toting a 1/4-inch mono jack socket for guitar in, a stereo mini-jack headphone out and TRRS plug for analog audio hook-up to the iPhone or 2nd-gen-plus iPod Touch. Oddly, for a guitar gadget, the mainstream media went bonkers for it, with mention made far and wide of this backline and floorboard palmtop solution. The New York Times, CNN, The Guardian and more carried articles heaping mounds of praise, while a gazillion YouTube clips appeared bringing amateur axe-wielders widdling to the fore. At around the same time, a certain Mr Jobs had a new toy in the offing - a halfway house between an iPhone/iPod Touch and a laptop in the shape of the slender iPad. 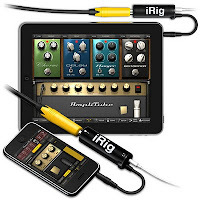 The iRig for iPhone having been near reviewed to death, let’s look at the iPaddy incarnation - not the cut-down freebie version, but the £11.99 commercial offering. I'm one of those people who sits on the metro looking insufferably smug with an iPad on my lap, playing Angry Birds while pretending to do something important. But a few months after iLaunch, it's wearing a bit thin and people get distracted by buskers, neglecting to gawp at iMe and my shiny new technology. What I really want is something I can use with my electric guitar, get amp sounds and have the excuse to deploy the axe wherever I will. You know the kind of thing; silently playing my leccie while gurning and tongue wiggling like Steve Vai, but in the middle of the rush hour, leaving buskers to go hang with their sorry renditions of Streets of London Where the Wonderwall Is. OK, IK, do your thing and pimp my iPad with what these iPod posers have been playing. Lo! And it has come to pass. 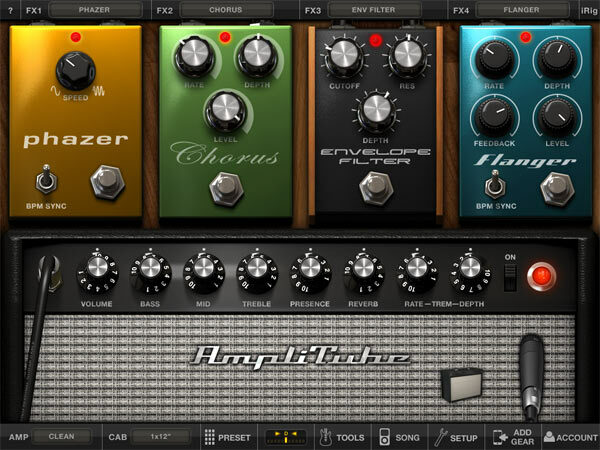 AmpliTube has made it to the iPad, so let’s dig in deep and dig it. For those unfamiliar, the laptop/workstation version of AmplTube, currently at version 3, boasts excellent emulations of most of the amps you've doubtless lusted after down the years. AmpliTube Fender in particular thoroughly impresses me with its accuracy of tone. 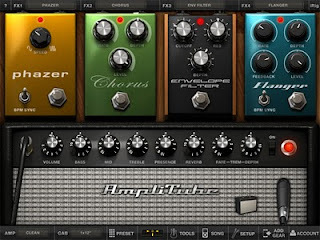 There’s also the means to mix and match amps, mics and floorboard effects from IK’s emulator ensemble - this is a developer that knows a thang or three about emulation, innovation and, given its high presence on various websites, plus plethora of special offers ever available, it knows a thong or four about marketing. As for hardware manufacture, the story isn’t so sweet. Can I say off the bat that if you were to use the iRig interface in any situation where breaking it would make you glum, then consider getting two? The hardware component feels flimsy, but I put it to you that we are a way off from seeing dervish-pogo death metal bands cavorting about stage with their guitars hooked up to WiFi+3G iPads, so with sensible, domestic use the iRig interface should last. While the iRig accepts line-ins from synths, mixers and other sound sources, I'm testing with a Gibson 339, a Fender American Telecaster, a G&L Comanche (think Strat with funny shaped pickups) and a JJ Retro (think solid body mahogany/maple cap, glued neck with twin humbuckers and - heavens to Betsy - some good-quality tonal control). Oh, and a pair of BeyerDynamic cans for monitoring - let's give this software a chance by slinging the bog-standard Apple earbuds. The onboard tuner will prove useful, as will the metronome at some point. So, I pay my £11.99, download AmpliTube for iPad from the App Store and power up. Yep, this looks like familiar territory for anyone who knows the grown-up computer version - a similar, if not the same, reassuring graphical front-end. I select one of the five amps on offer - Clean, Crunch, Lead, Metal and Bass - then choose one of the five speaker cabs and have a swipe at my guitar strings. Hmph. Thus far, I'm not in sonic nirvana the way I have been with AmpliTube 3. For one thing, there's a real hiss to this, but one of the four effect slots accommodates a noise filter which has one control. I'm assuming it attenuates the treble frequencies because by the time it’s taken the noise down, the guitar sound becomes muggy. A tweak on the amp’s treble dial goes some way towards alleviating this, but it’s a, albeit minor, gripe. Because the iPad is a touch-screen device screen, I wanted to adjust the knobs using a rotary finger motion, but the dials respond to up/down movements and so I got the dial going in the opposite direction I thought it was supposed to go. Something to get used to, I guess, but I'd be interested to see how an iPhone/iPod user makes minor changes using rotary dials on a small screen. I know it's not as realistic looking to have sliders (and I admit I'm a sucker for realistic graphics), but I'd have preferred them. Now I appreciate that there will always be problems getting a live sound into a computer and IK is having to build down to a price, but I'm sorry to say I don't want to have to fight my audio interface every time I want anything like decent volume coming through the headphones. I’ll skip the hissy fit, flick through the presets and, ahh that’s better. I like them, although I'm sure I'd like them more if I wasn't having problems with iRig noise. Tonally, all the main bases are covered, from clean to filth. Clean tones on the verge of breakup oft pose problems for amp emulators, but iPad AmpliTube renders cleanliness well. While the sounds didn't blow me away, where this system shines is in the portablity of the hardware that supports it. I spend a few weeks a year abroad and, while I've yet to see an app that I think is better than big, grown-up PC/Mac software, the portability of the apps I do have made my last trip so much better. Stripped down though it is from AmpliTube 3, this iPad incarnation covers my peripatetic pluckings quite adequately. Preset nomenclature leaves something to be desired - you won't find such descriptive monickers as ‘Rubbed Backside Up A Rusty Drainpipe Howl’, for example. It’s merely preset numbers 1 through 9, plus user slots in which to store your own configurations, taking the slot count to 36. 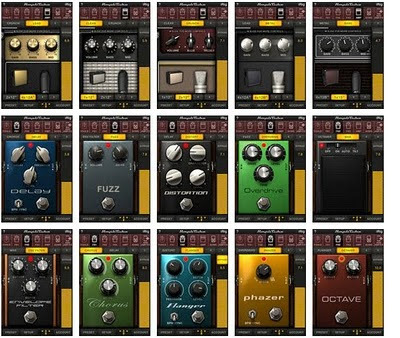 As with AmpliTube 3, you can't move the effects boxes from one lot to another. Am I the only guitarist who wants to see the effect of moving things around in an FX chain? And where's the record button? I don't need one with AmpliTube 3 because I can use it inside a sequencer. But some way of recording ideas would be nice if this is my only portable guitar software. On the plus side, you can import up to 20 songs from your computer to use as backing tracks by typing in a URL and selecting from the system - a pretty straightforward process, but I'd still like access to my iTunes library. 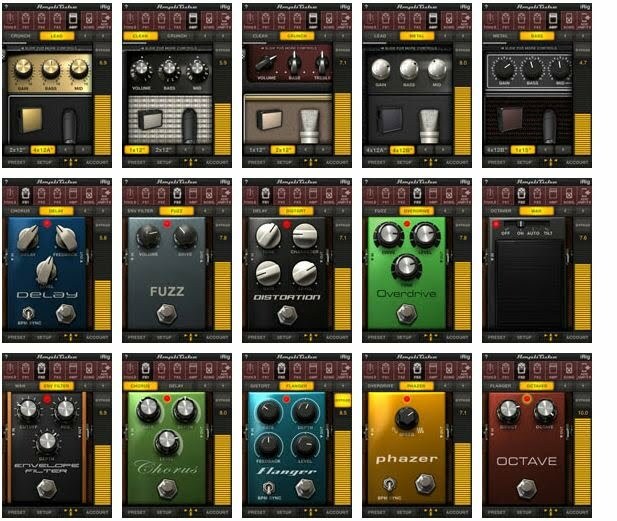 It strikes me that it’s no easy feat to take the concept of modelling realistic amps with realistic looking graphical front ends destined for powerful computers, then squeezing them into a less powerful computer with much less screen real estate. Don't get me wrong. I like that I can use an iPad with AmpliTube to serve as an amp simulator and jam along to backing tracks, though not from the iTunes library. But I can't help but feel that IK has excluded a few too many key features in this offering. Or is such extensibility just too computationally demanding? I want to like this set-up more than I do. You have the technology, IK, and know how to make it so much better. I hope you do in the next version, although some new goodies are promised soon and the developer is actively working on the noise issue, which is mainly relevant to the high-gain settings as you'd expect of any amp, physical or simulated. Look out for an update to this piece in the not-too-distant.